ALLEGRA BOVERMAN/Staff photo. Gloucester Daily Times. Gloucester: The Gloucester Maritime Center works with classes at Veterans Memorial Elementary School from time to time. For the third grade science unit on rocks and minerals and sediment, Curtis Sarkin, a center educator, shows the students layers of sedimentary rock and sandstone, and then taught the children about how fossils are made, with the pupils creating their own. 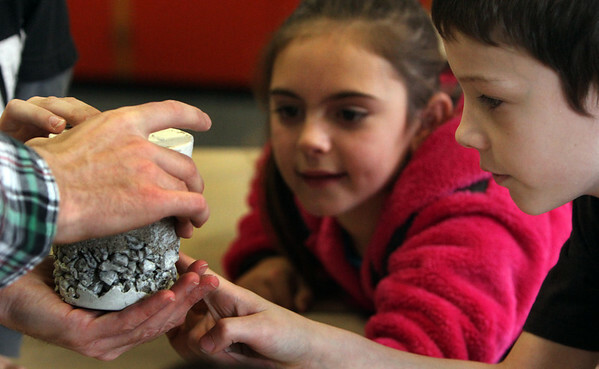 Looking closely at the sandstone layers are third graders Matina Billante, center, and Aiden Quarterone, right.